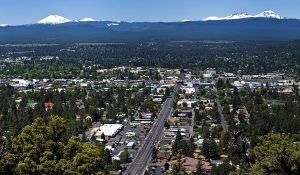 BEND, OR -- The latest statewide population study reveals what most Central Oregonians already know: the region continues to grow. "There’s demographers at Portland State that estimate population based on building permits, based on building permits and a whole formula. And they do that every year," says Bend City Manager Eric King, "So, Bend’s population based on their estimate was 86,700-something, and that’s about a 3.9% increase, year over year." In fact, according to PSU's Population Research Center, Bend has over 3,200 more people than a year ago and now has a population near 86,800. King wasn’t surprised by the numbers. "It just confirms what we all sometimes – you know, there’s the anecdotal information and there’s the actual data. And, those two things match up." He tells KBND News the data is important for planning future infrastructure, housing and other needs. "Our population forecast and all the land that we have available, and the infrastructure that serves that land, it’s all based on basically a 2030 forecast of 130,000 folks. And, we’re on track to meet that." Deschutes County was the fastest growing county in Oregon, with a 3.6% increase over last year. Crook county came in second with 2.4% growth. Oregon's statewide population has now topped 4.1 million; mainly from people moving in from out of state.